A tough and hardy shrub with elongared green foliage, red tinged when young and occasionally mottled with cream and pink. Deep rosy pink flower heads appear throughout the summer. Spiraea’s are part of the Rosaceae family – the same botanical family as the rose. They can be found throughout most of North America, Europe and Mexico. This hardy cultivar, Anthony Waterer the ‘Japanese Spiraea’ is a very pretty and compact deciduous upright shrub with elongated green foliage. The foliage is reddish when young, occasionally becoming marbled cream and pink late in the season, giving varying interest over a number of months. Pretty domed heads of deep rosy pink flowers are produced throughout the summer months are set off beautifully by the attractive foliage. The foliage is reddish when young, occasionally becoming marbled cream and pink late in the season, giving varying interest over a number of months. Pretty domed heads of deep rosy pink flowers are produced throughout the summer months are set off beautifully by the attractive foliage. 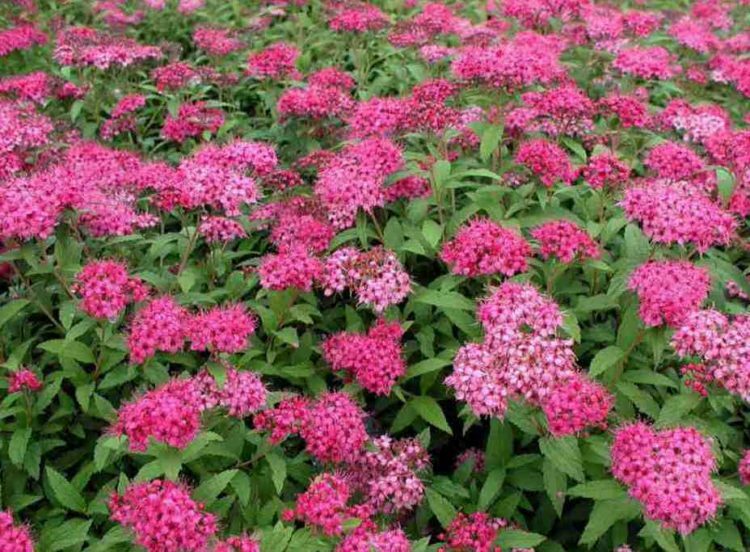 Spiraea Anthony Waterer is an easy to grow hardy shrub that will grow in almost any reasonable moist well drained soil, but does appreciate the addition of organic matter together with a mulch if planted in chalky soil. It can be planted in either an exposed or sheltered position in full sun or part shade. Growing up to 120cm it requires little pruning which should be done in spring, as it forms buds on new wood produced in the same season. This will also to help maintain its shape but if it has become overgrown it can be cut back hard every few years, but this must only be done in late winter or early spring. These are sold by us as pot grown plants and are therefore available all year. Please do contact us if you have any other questions or require further assistance in quantities required and we would be very happy to help you.